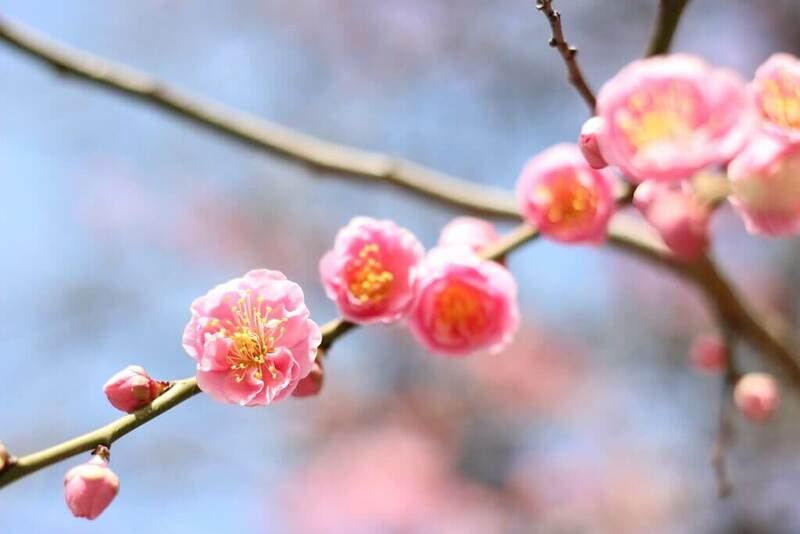 Originally introduced to Japan from China, plum blossoms begin blooming around February in most parts of the country. When the chill of winter begins to give way to the warmer spring breeze, you’ll see tree branches festooned with these tiny flowers in a myriad shades—from white to pink. Ume also have a delicate and sweet floral fragrance. 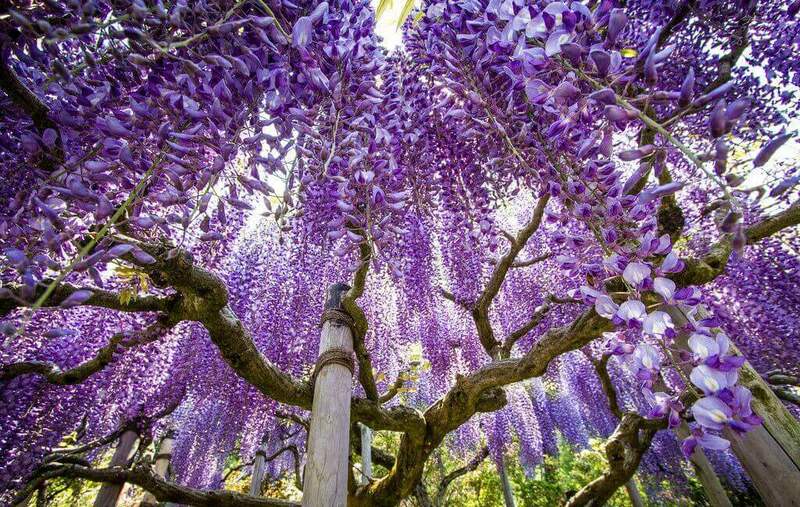 While they haven’t quite surpassed cherry blossoms in popularity yet, I find wisteria far more captivating. Walking through a wisteria tunnel is incredibly dreamy, with the flowers cascading down in swaying ribbons of lavender and periwinkle. Late April through to early or mid-May is generally the best season for fuji viewing. The rainy season isn’t exactly the most popular time of year to travel to Japan, but I love being here when it’s wet out, because it’s the best time to see the hydrangeas. Ajisai or hydrangea flowers range from pink to blue to purple depending on soil pH, and they have graceful, tooth-edged leaves. The varieties with their mop-like clusters are well-loved by travelers, and in the rain, hydrangeas look particularly lustrous. For more suggestions on where to view them, check out our post on what to do on a rainy day in Japan. Irises have been an integral motif in Japanese art and literature through the ages. Anyone who has a passing familiarity with Japanese art will have encountered Rimpa artist Ogata Korin’s Kakitsubata-zu—vibrant paintings of indigo rabbit-ear irises on gold screens. Seeing irises in person makes me want to paint them as well. While Kyoto’s Golden Pavilion is overcrowded and best avoided during the cherry blossom festival, it’s worth a visit when the irises in the pond are in bloom, so you can see their violet petals contrasting with the shiny gold structure. Depending on the species, irises have a fairly long blooming period, from early April to the end of June. Most varieties seem to peak around the middle to end of June. If you need more than hydrangeas to sell you on a rainy season trip to Japan, why not add iris-viewing to your plans? Hokkaido might be freezing for most of the year, but come summertime it almost starts to feel like spring. From June to August, Hokkaido is a balmy respite from the sweltering sweat-fest that is the rest of the Japanese mainland. As you can guess, a wide variety of flowers bloom at this time of year, and the lavender fields in Hokkaido are a perennial favorite. While lavender isn’t native to Japan, it’s been cultivated here for more than half a century. It also has a relatively long flowering season, for about a month in July. An interesting place to view lavender is Shikisai Hill, a gorgeous flower field in Biei, where farmers planted flowers of different colours in long stripes across a 7-hectare hill. It looks pretty cool, in a Fifth Doctor’s scarf sort of way. Summer heat and humidity might deter some travelers from visiting Japan in the summer, but the coolness of early mornings is quite pleasant. This is also the perfect time of the day for kanrensetsu, or lotus flower viewing. These gorgeous aquatic flowers bloom early in the morning, typically before 8 a.m., so parks and gardens with lotus ponds are often open quite early for visitors to enjoy them. The Kyoto Botanical Gardens is one example, though at other gardens (like the Okayama City’s Korakuen Garden), visitors can ride boats around a lotus pond to witness the opened flowers up close. That being said, lotus-viewing is definitely not for those with trypophobia (a fear of holes.) The centre of the lotus flower, or seed head, is a cluster of holes guaranteed to make your skin crawl. Nemophila is a flower with an unfortunate-sounding name, but it is utterly enchanting—both individually and in vast quantities. It is hard not to be delighted by these “baby blue eyes,” especially a carpet of them beneath equally blue skies. Late April to May is the best time to find nemophila in Japan. One of the most popular places near Tokyo is Hitachi Seaside Park in the Ibaraki prefecture. Ibaraki isn’t exactly on most travel bucket lists, but this flower park is well worth the time it takes to get there. Though most visitors associate cherry blossoms with Japan, the chrysanthemum is actually the unofficial national flower of Japan. It appears on the Japanese passport, the Imperial crest, kimono, and the 50-yen-coin. Additionally, you can find special chrysanthemum-themed festivals across the country to visit. My fondest memory of this flower is seeing the delicate pastel pom-poms on their long, thin stems while walking through the countryside, sitting in vases and brightening up the facades of rural country homes. If flower-viewing isn’t your jam, but you love being in nature, maybe you would be interested in moss-viewing. Moss appreciation has become very popular in recent years, but a love for moss runs long and deep in Japan. Unlike in North America and Europe, here attitudes on moss reflect important aspects of Japanese culture. There is value placed on slow growth, perseverance through difficult conditions, and understated beauty; all qualities that moss embodies. It doesn’t hurt that Japan is quite humid and home to 2500 varieties of moss, out of an estimated 12,000 species in the world, making it a fantastic place for moss to grow. Most Japanese temples are moss-friendly, and allow it to grow in rock striations, between cobblestones and walls, and in lush carpets around trees and flowers. For more specialized moss-viewing, you’ll want to visit a place like Saiho-ji Temple—which has around 120 varieties of mosses—or Yakushima, the holy land for moss pilgrimages. They might not produce maple syrup, but the Japanese acer or maple tree, with its gorgeous, star-like leaves, brightens up the autumn landscape across the country. These trees can turn entire swathes of forest and mountain into blasts of fiery red and gold. Beginning in the far north in Hokkaido from around mid September, the bold colours of momiji then shift south through Japan over the next few months. Some areas in Kyushu peak in late November to early December. The bold autumnal colours are quite different, and a bit less ephemeral than the cherry blossoms. 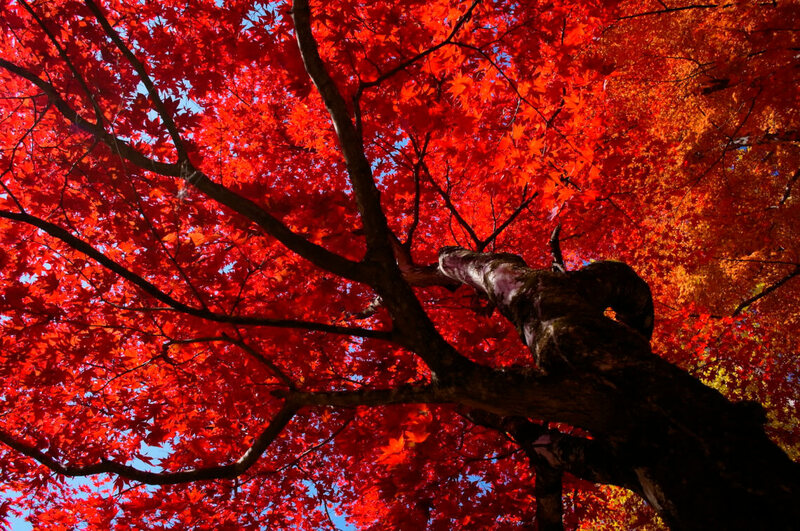 This means that if you are keen on some maple-viewing, you have a several month window in which to plan your Japan travel in the fall. One of the other botanical stars in autumn is the ginkgo tree. I love these even more, perhaps, than the maples. There are few things more glorious than visiting a temple and seeing a several-hundred-year-old gingko tree stretching to the heavens, wreathed entirely in yellow leaves like pure gold and sunshine. They’re also commonly grown along some avenues and streets, making your average city walk even more delightful than usual.